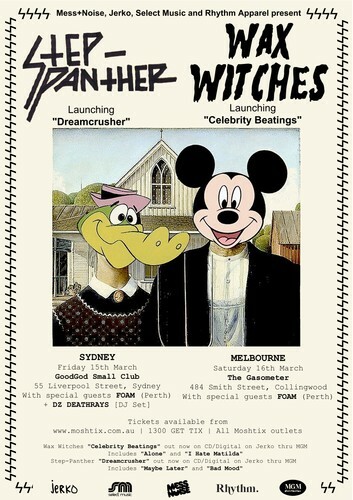 Sydney shred-rockers Step-Panther and Gold Coast gonzo-punks Wax Witches are teaming up to launch their respective new EP and album, with joint shows together in Sydney and Melbourne in mid-March. Both titles were released on new Sydney label Jerko (distributed thru MGM). Step-Panther's Dreamcrusher EP was recorded in Berlin and Sydney, with producers Simon Berkfinger (ex-Philadelphia Grand Jury, now Feelings) and Wade Keighran (from Wolf & Cub). The 4-track release includes last year's lead-off song Maybe Later, which Beat (Melbourne) frothed hits the mark with a brazen display of teenage brattiness, and recent single Bad Mood which had Sexbeat (London) espousing its colossal wall of sound. Wax Witches is the solo project of Bleeding Knees Club frontman Alex Wall. The debut album Celebrity Beatings was recorded in his bedroom on the Gold Coast, with nearly every instrument performed by Wall. Its brat-blast noise-pop channels his professed love of California punk and psych culture, and had Get Bent (USA) hailing it as Wonderfully fuzzy and dizzyingly kaleidoscopic. The Wax Witches live band will be expanded to a three-piece for the first time ever for these launches. Special guests on both dates will be fresh Perth garage-rockers Foam, making their inaugural East Coast trip. The trio were recently hand-picked by triple j Unearthed to open the WA leg of the Big Day Out festival, and their singles So Far So Good and Total Body Disruption have been making waves on airwaves nationwide. Step-Panther's Dreamcrusher and Wax Witches Celebrity Beatings are both out now on CD/Digital on Jerko thru MGM.